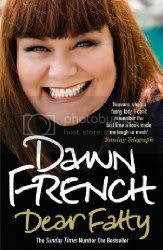 Dawn French (one half of the British comedy duo, French and Saunders) may be one of the funniest women alive today. The other funniest woman alive today is Jennifer Saunders, the other half of French and Saunders. For those not familiar with either, they have had a successful run at BBC with their variety show, French and Saunders; Dawn French may be best known for her role in The Vicar of Dibley; Jennifer Saunders is probably best know for her role as Edina in Absolutely Fabulous; both have also starred in shows too numerous to list here. And every single show that I have seen them in has been top notch. Dear Fatty is Dawn French's memoir. Like anything that French does, her memoir is frequently laugh-out-loud funny. What surprised me most about her memoir is how unflinchingly honest she is throughout. She relates her life, both its ups and downs, as best she remembers it. Written in the form of letters to her friends and loved ones, Dear Fatty touches on the funny and the sad in French's life. For instance, one letter is to her father, who committed suicide when she was 19, and in one paragraph that goes on for almost two pages, she asks him questions. Why he did what he did; why didn't he ask for help; etc. By the end of this particular letter, I'm not ashamed to say that I had tears in my eyes. Her frustration of 30 years of unanswered questions is so evident, and she does nothing to hide that. Of course, not wanting to keep her readers in too serious a mood, she immediately segues into far more lighthearted material, but that honesty is there and it can be raw and emotional, and I respect her all the more for it. "It's a process of having faith in the self you don't quite know you are yet... Believing that you will find the strength, the means somehow, and trusting in that..."
Words that speak volumes to me in my life right now. I don't that many people would rush out to buy this book. First off, I'm not even sure it's available in the US yet, and secondly, I don't know that anyone who isn't a fan of Dawn French would really care all that much. But for those of us who are fans, this is a gem of a book, and even if you aren't a fan of Dawn French, I still think you'd find this a funny and revealing look into the life of one of the funniest ladies out there right now.